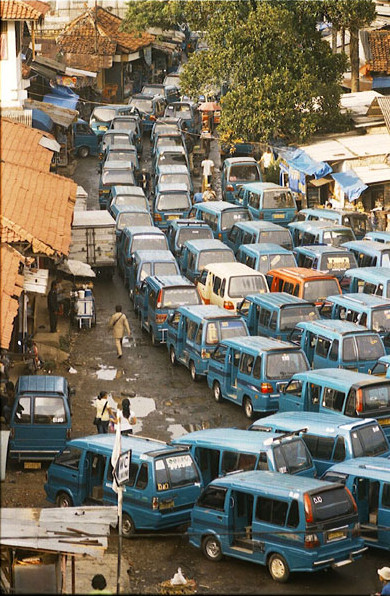 The Depok Baru bus station in Cimanggis, Indonesia. Photo by Danumurthi Mahendra, via Flickr. Click above to see the photo at Flickr. Site: Depok Baru Bus Station. Late afternoon after a storm. Minibuses queque in line for hours to get out of station. Kodak 200, Canon 135mm f/3.5, AE-1. If you would like to a submit a photo or photos of something transportation-related for our daily ‘art of transit’ feature, post them to Metro’s Flickr group or email them to sourcemetro@gmail.com. I’ve taken all the photos that we’ve featured in our daily ‘art of transit’ posts and added them to a gallery on Flickr. Or you can click on the ‘art of transit’ below to view our daily posts.